not be logged in automatically. In other words: can AdminGuy just unlock the drive, but then have a login screen popup so OtherGuy could choose to login instead? The user account that unlocked the drive will be logged into their own account after start up completes, without needing to log in again. If you want to make the Mac available to a user that does not have unlock capabilities, log in, then when you see your own desktop, choose "Log Out (user name)" from the Apple () menu. Also, you can unlock the disk, then choose the other user's name from the Fast User Switch (appears as the currently-logged in user's name) menubar item in the upper-right part of the screen. give the passphrase for the volume to AdminGuy. At step 4 above, use a method that preserves the Apple_Boot slice (sometimes named Boot OS X, sometimes named Recovery HD) whilst restoring the JHFS+ startup volume. 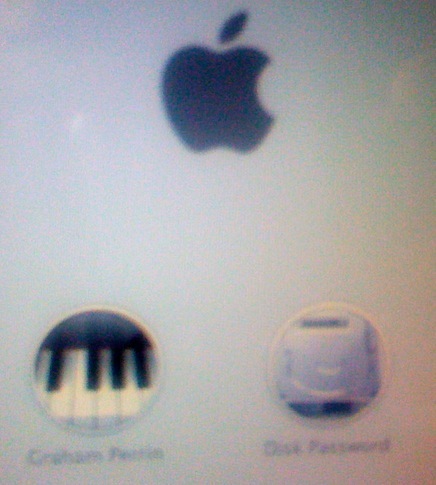 As Disk Password has an avatar/icon, it's clear that Apple considers scenarios such as this. when loginwindow appears, select the required user. Users may change their login passwords. The phrase for Disk Password will remain unchanged. You need not use the FileVault areas of System Preferences but if you do, most things work as expected. System Preferences in Build 12A269 of OS X 10.8 may state that FileVault is enabled, with a recovery key set, when the key is no longer applicable. (Assume that an erased volume, with a possibly different passphrase, will not accept a recovery key that was set before erasure. A more definite opinion may be drawn from Infiltrate the Vault: Security Analysis and Decryption of Lion Full Disk Encryption (2012).) I have reported bugs to Apple. Photographs above are of the USB flash drive that I used to validate this answer. Photographs below are of the internal drive that I use every day. 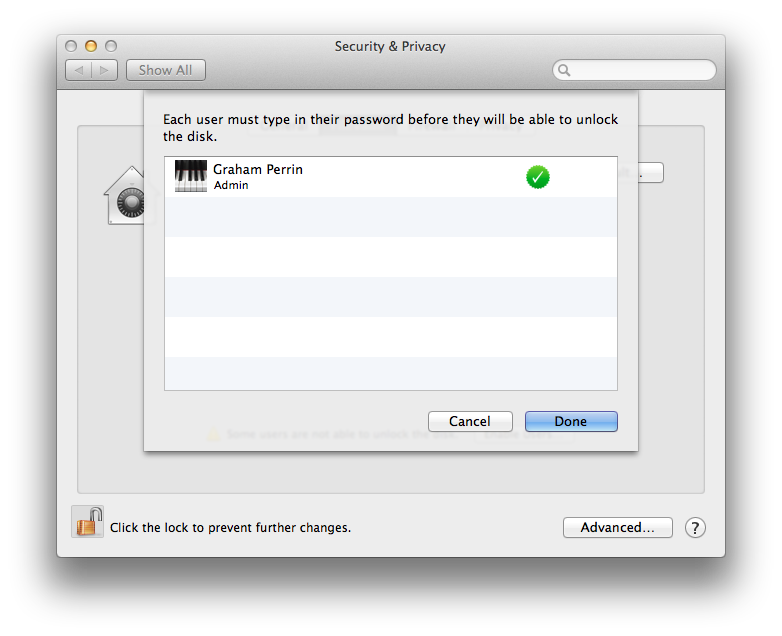 When you turn on FileVault, you can select which accounts have the right to unlock the drive. From there you can choose the AdminGuy account as the only authorised account. 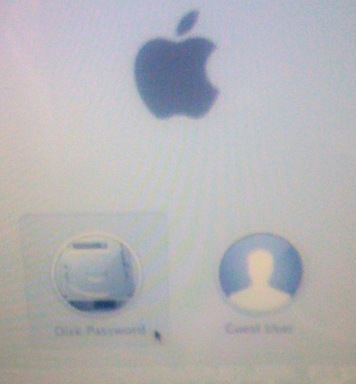 As for auto-login, after you turn on FileVault, automatic login is turned off. So you just have to enable FileVault normally and you will get your answers through the process. Install OS on the encrypted partition. 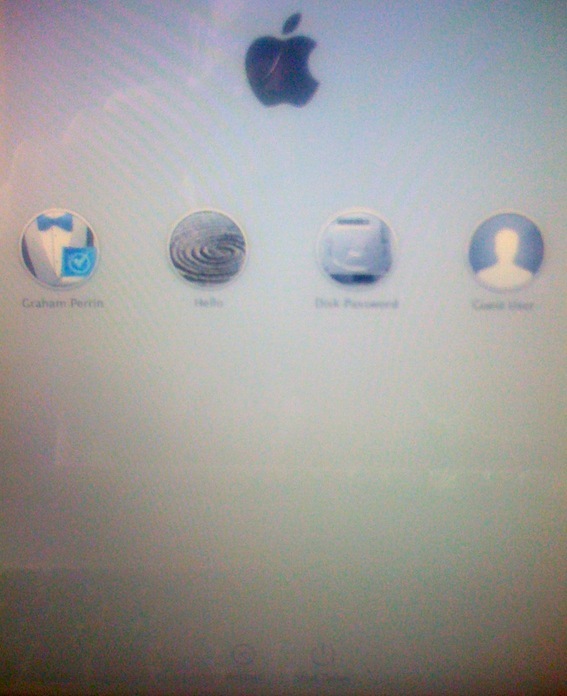 Create the first account "the administrator account". Add normal or admin users. Use terminal to remove the admin user and the other users enabled with the account. (Should look like this): sudo fdesetup remove -user "username"
Restart to make sure only the DEK Disk Password login is available at boot up. Not the answer you're looking for? 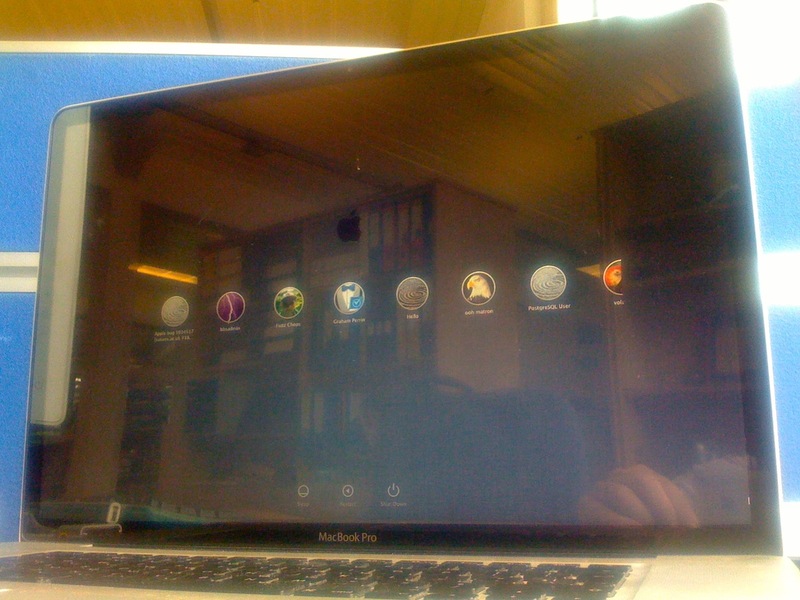 Browse other questions tagged mountain-lion boot user-account login filevault . 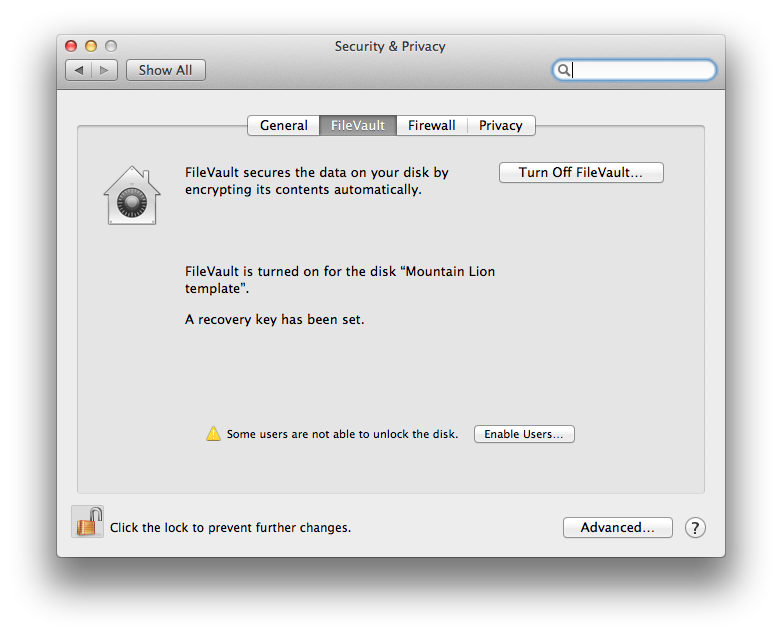 How to disable unlock with Apple ID in Mountain Lion when FileVault is enabled? FileVault: How come a new user can log in without disk password?